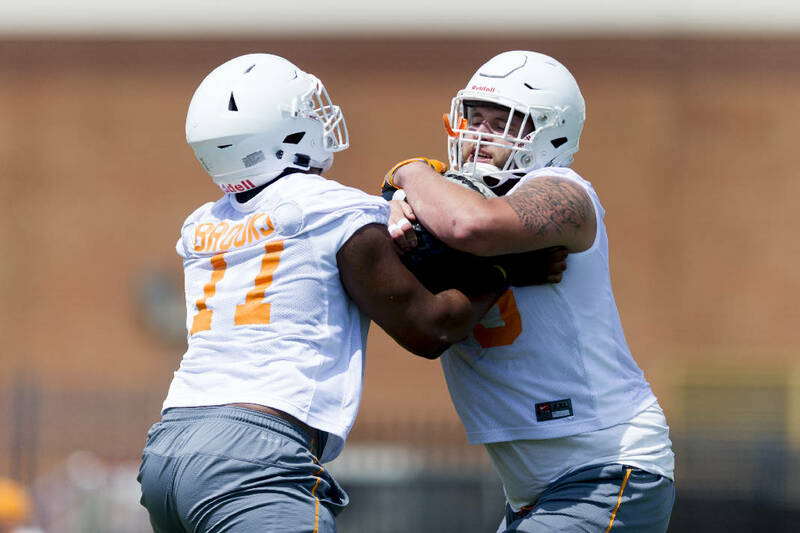 KNOXVILLE — The first official practice of Team 121's preseason complete Saturday afternoon, Tennessee football coach Butch Jones bumped junior quarterback Quinten Dormady's backside as the coach exited Haslam Field. Knowing Coach Crewcut's time with the media had just ended, Dormady asked how it had gone. Jones instantly flashed a big grin across his sunburned face, offered twin thumbs-up signs, then said with at least a hint of cynicism, "I'm sure they'll find something to talk about." The talk takes off now, as fast as Usain Bolt, as loud as the late comedian Sam Kinison, as constant as the Weather Channel. A third of it will be as optimistic as Disney World, a third as realistic as CNN, a third as pessimistic as a Democrat grading Donald Trump. But regardless of how you currently view the Volunteers, it's here — football time in Tennessee, as the great announcer John Ward so distinctly used to say — and if a few sound bites from Saturday are any indication, there is a strong sense within the team that Jones just might post his first 10-win season in his fifth year on the job. "Everybody took the offseason serious," said senior defensive lineman Kendall Vickers, who was wearing a coat and tie at Southeastern Conference media days the last time he faced microphones and notepads. "Everybody came back ready to play. And our young guys really looked good out there." Added linebacker Cortez McDowell: "It's just great to be back out there with my teammates. It's a day-to-day process — getting our team better and getting each other better." Then there was Dormady, the tall Texan who's fighting it out with redshirt freshman Jarrett Guarantano for the starting quarterback spot. Asked what he thought of new quarterbacks coach Mike Canales' recent comments that Dormady and Guarantano might possibly split those duties, Dormady said he'd have to think back to middle school to recall a time he "shared some reps."
But those words were almost instantly followed by these: "We're all just here to win a championship." The Big Orange hasn't won an SEC championship since 1998. It hasn't played for one since 2007. It hasn't been in a top-tier bowl game since losing to Nebraska in the Fiesta Bowl at the close of the 1999 season. That 17-year run of mediocrity is the longest drought outside a BCS-level or College Football Playoff-tabbed bowl game since Robert Neyland first took over the Vols in 1936. And ending that streak will require more than mere words about winning a championship. Especially when that championship, if only on the SEC level rather than national in nature, almost assuredly will have to come through Alabama — a program the Vols haven't beaten since 2006, the year before Bama boss Nick Saban arrived. Heck, to return to those media days from early July, the Vols weren't even picked to win the league's East Division, finishing a distant third to Georgia (138 first-place votes) and Florida (96). Not only did Tennessee get only three first-place votes for the East in the media poll, it actually got two fewer than South Carolina, though it did finish ahead of the Gamecocks in the overall poll despite losing at South Carolina last season. Yet there is also something to like about this team, beginning with its seeming emotional stability and extending to its talent, which may be far better than anyone realizes at the moment. "Competition is good," Dormady said. "Everybody came here to start. Everybody came here to play at the next level. Competition brings out the best in everybody." An overwhelming number of injuries brought out the worst in the Vols a year ago. To hear from Jones on Friday that at least three of those key players — junior offensive lineman Chance Hall, junior linebacker Darrin Kirkland Jr. and junior defensive tackle Shy Tuttle — are limited at the start of this preseason camp could cause early concern about the ceiling for success this autumn. Fully healthy or close to it, Tennessee can win the East. If the Vols must play at 80 percent or less — as they often did a year ago — they might do well to finish third in the division. But that's a worry for much further into the future than the close of the first day of practice. For now it's one drill at a time, one day at a time. And while an enthusiastic Jones said of Saturday's effort, "I thought it was a very, very productive start," he also noted, "We can't make the same mistakes when we come back tomorrow." From those seemingly disparate views the entire Big Orange Nation will find much speculative talk until the Sept. 4 opener against Georgia Tech in Atlanta gives them something far more concrete to discuss.